My niece Cathy was here this weekend and we played all weekend trying some new fun techniques. We didn't get a lot of finished creations accomplished, but I will be posting some soon. I started with using Antique Linen Paint and Tim Holtz Dot Fade THS006 Stencil. After drying, Brushed Corduroy, Moss Green and Vintage Photo Distressed inks were used to distress. The nice thing about using the paints is you can distressed right over it and the stenciling will not fade. Then a piece of drywall tape was inked and taped to the tag. The Magnificent Pine was cut out of Grunge paper and inked with Moss Green Distressed Ink. The numbers 25 were stenciled using Tim's Cargo Stencil and Fired Brick. 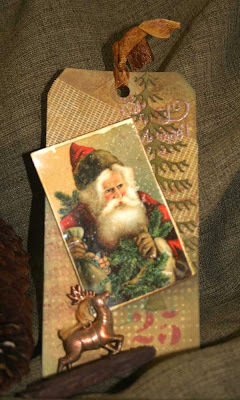 Santa was attached to Elizabeth Craft Transfer paper and then to card stock and distressed to give it an aged look. The silver deer charm was colored with Distress Paint. How wonderful that you & Cathy had some time to 'play' together. LOVE this tag and that Santa (which I know I've seen through Crafty Secrets and I think a few other places) is one of my favorite vintage Santas! All the elements together are fabulous and thanks for letting us know about the items you've used for your techniques. I have another (small) craft show coming up on the 30th and hope to make a few Christmas tags for it as I sold out of them at the last show. Thanks for wonderful inspiration! A really wonderful christmas tag here Joan. I too love this vintage Santa, it looks fabulous. Beautiful vintage tag...and LOVE how those TH stencils came out, I should of purchased more!!! How fun for you and Cathy to be able to get together for some creative time! !